Pasadena, CA, USA (September 20, 2016) — Mycotoo, Inc., The Entertainment Development Company, is partnering with Six Flags Magic Mountain on their newest walk-through attraction: Aftermath 2: Chaos Rising, a very large outdoor maze that is part of the park’s 24th season of Fright Fest®. 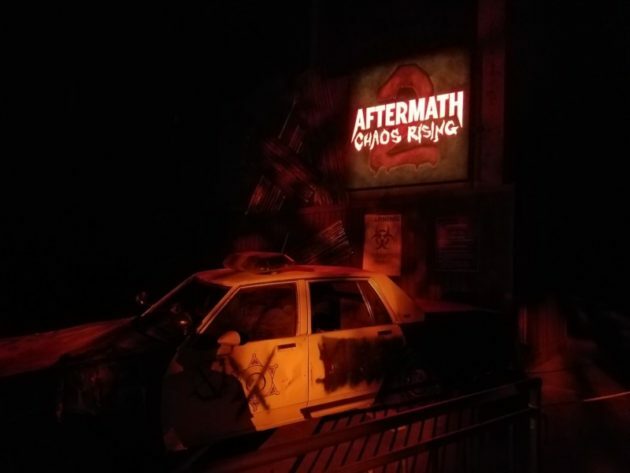 Aftermath 2: Chaos Rising is a 40,000 square feet experience, featuring over 1,500 feet of linear walls, enough to beckon thrill-seekers and haunt enthusiasts. Those who dare to enter must race to survive a half-mile of gore, two-story high custom facades and a total of 13 new horrifying scenes. The design approach immerses guests into a world that changes constantly, making the attraction extremely repeatable. This “choose-your-own-haunt” experience separates guests from each other and utilizes the latest trends and effects to create disorienting environments. David Wally (Chief Creative Officer), Ryan Holmes (Sr. Producer) and Daniel Hirsch (Production Designer) led the Mycotoo team.